It’s been a long, hot summer, but the days of children chasing fireflies, riding bikes and coming home with pockets full of dirt, rocks and empty candy wrappers are about to come to an end, because there’s something lurking just around the corner. The students are nervous, and so are the parents. Getting on that bus for the first time can be especially nerve-wracking for everyone. What time is the bus going to get there? When should mom or dad send their child to the stop? Will the bus be here before mom or dad needs to leave for work? If they leave for work before the bus arrives, how will they know if their child got on board? Schools can eliminate questions like these with a bus tracker app such as Synovia’s Here Comes the Bus®. “I don’t have that worry or have the built-up frustration anymore,” explains one parent. Instead, they pull out their phone and know exactly where the bus is in real time and how long it will be until it reaches the designated stop. in one of our customer school districts. This is the kind of clarity that Here Comes the Bus app users enjoy. Furthermore, gone is the need for parents to call the transportation department to ask where the bus is when it’s late, or to complain when it’s missed altogether if it comes early. Parents are alerted when the bus is near, and they can find its location at any time. That means schools deal with fewer and fewer frustrated parents, and your staff spends less time on the phone answering questions. With Here Comes the Bus, worries are gone for parents, and therefore for school transportation departments as well. In the past, waiting at the bus stop was simply a fact of life for students, no matter what the weather was like. 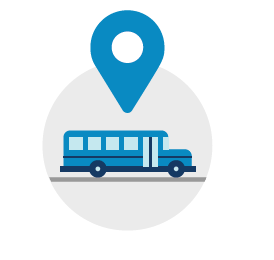 With a bus tracker app, parents and students both know exactly where the bus is, so they can better gauge when it’s time to send their children to the stop. No longer do kids need to wait in the rain, cold, or scorching heat. They simply go to the stop exactly when they need to. Ultimately, less stress and fewer missed buses leads to happier parents and students in your district. Giving your families real-time GPS tracking capabilities makes everyone’s mornings a little less crazy. “I don’t know how I survived as a parent without this app last year. It times my whole morning,” said Kelli Knisley, a parent from Avon Community Schools. The Here Comes the Bus app can drastically improve mornings for everyone involved. Bus pick-up times don’t have to be a challenge. Take the guesswork out of it by giving your parents and students the visibility and safety they need. If you'd like to learn more about Here Comes the Bus, download our newest edition of our magazine, Ridealong with Synovia Solutins. In this edition, we help make sure your transportation team is ready for the new school year.